A live broadcast on CCTV of a Tianjin press conference was unceremoniously cut short after reporters started bombarding officials with awkward questions, but the presser itself didn’t end there and video of Chinese journalists asking more aggressive questions that the TV cameras didn’t catch has leaked online. In yesterday morning’s press conference, a government spokesperson tried to reassure journalists that the wind was blowing dangerous pollutants away from Tianjin. After that he tried to leave but was hit by questions from angry reporters. After one journalist asked how far away hazardous material should be stored from residential areas, the official was stunned to silence. Dumbfounded, he gave a brief response “There’s a standard” before the live feed cut back to the news studio. “If you have the opportunity, please make a trip down to the site for yourself. 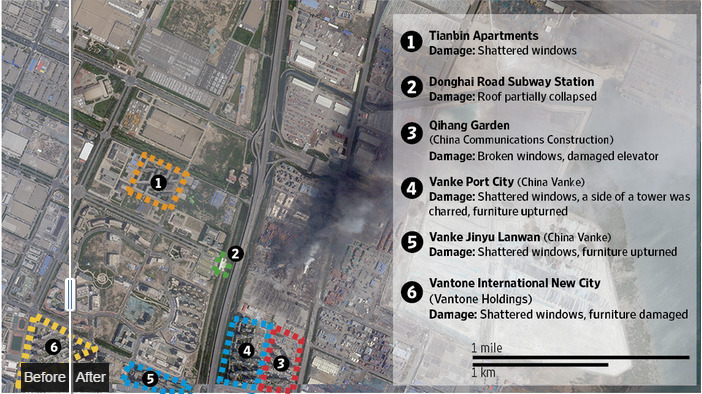 The warehouse is still pretty far from the residential compounds, but because of the huge magnitude of the explosions, they were still hit. Of course, it has since been revealed that that residential buildings were in fact too close to the chemical warehouse.